What's Up (And Down) With The Economy? HomeBusinessWhat’s Up (And Down) With The Economy? What’s Up (And Down) With The Economy? Is there a new recession looming? That’s the burning question (again) these days, and understandably so. The slowdown in job creation is reason enough to worry. As troubling as that is, there’s discouraging news on consumer spending and weak July reports for the manufacturing and services sectors. Adding to the anxiety is the fear that the push in Washington to cut spending at a time of weak economic growth will only exacerbate the problem, although the pro-austerity crowd argues otherwise. 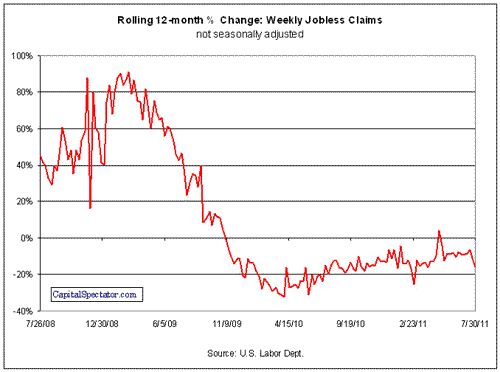 All of which sets us up for the latest update on initial jobless claims. Unfortunately, the number du jour doesn’t tell us much. New filings for unemployment benefits slipped a scant 1,000 last week to a seasonally adjusted 400,000, the Labor Department reports. That’s the lowest in nearly four months, but it’s also ambiguous at a time when the crowd’s desperate for strong signals about what comes next. But as the chart below suggests, it’s unclear if we’re set to resume the fall in new jobless claims or stuck at an elevated level. 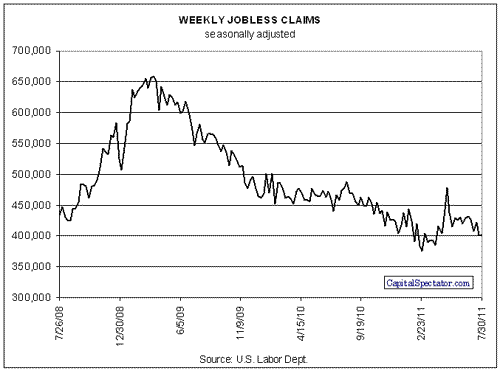 By comparison, the raw year-over-year change in jobless claims looks more encouraging. New filings were nearly 16% lower last week vs. the same period a year ago on an unadjusted basis, as the second chart shows. It’s too soon to say if this marks a period of renewed decline for fresh claims, but on its face it looks promising. At the very least, the latest annual change in unadjusted claims doesn’t suggest a recession is imminent. It’s widely accepted that a slowly growing economy is more likely to tip into recession, for the obvious reason that it’s already too close to the line; any shock can knock it into negative territory. And today’s slow growth is at least in part a symptom of underlying problems such as consumer indebtedness, high energy prices, and the jitters induced by debt ceiling brinkmanship. Surely the risk of recession is higher today vs. six months ago. Indeed, I was writing about warning signs in May and it’s clear that the danger hasn’t passed. But it’s also debatable if a double dip is a done deal. There are still positive signs out there and so it’s still debatable if the forces of growth will hold the line against the demons of contraction. Speaking of the stock market, one of the metrics I watch is the 12-month percentage change for the S&P 500. It’s not perfect (nothing is), but it has a decent record of anticipating a new recession by tumbling to a loss vs. the previous year. 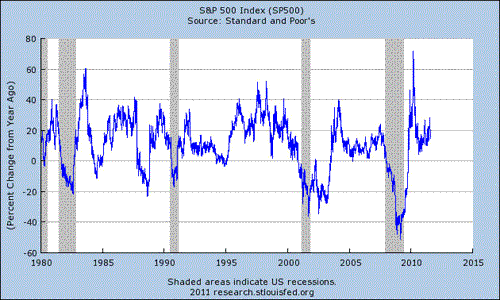 Every recession in the past 50 years has been accompanied by an annual loss in the stock market. By that standard, there’s still a healthy comfort margin: the S&P remains up by well over 10% compared with its year-earlier price. There are other encouraging signs too, including a positively sloped yield curve. History suggests that a new recession is near when short Treasury rates rise above long rates. But with the 3-month T-bills near zero and the 10-year Note at roughly 2.6%, there’s minimal risk of an inverted yield curve in the near term according to this measure. There are dozens of other indicators to evaluate, of course, although the key factor remains the labor market at this point. But here too the trend, while battered, still looks mildly favorable. Recessions invariably are linked with declines in private sector job creation. Although the numbers have been weak on this front, there’ll still positive, as ADP advised yesterday. Economists are also predicting growth in tomorrow’s update on July employment from the Labor Department. There are still no guarantees. Lots of risk resides on the macro landscape. But considering the numbers in hand, it’s not yet clear that another recession is fate. That outlook is subject to revision with the arrival of each new data point, of course, but that’s par for the course in the dismal science. Predicting is still hard, especially about the future.